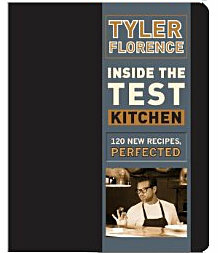 Not that long ago, I cooked some recipes from Tyler Florence's Real Kitchen , so I was pretty excited to get my paws on his new book, Inside the Test Kitchen . 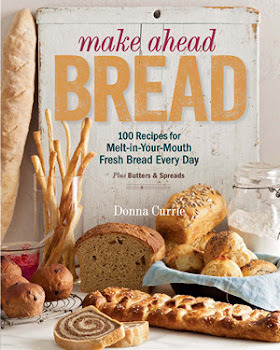 This new book is more than a book of recipes. It's like a mad scientist wandered into the kitchen and whispered in a few ears. There are plenty of normal recipes, but there are also some totally wacky ones, like making burger buns by putting the batter into a soda siphon and spraying it into round molds on a griddle. I want to give that a try, for sure, but I decided to make a more normal recipe first. Because not everyone's got a soda siphon. I wanted to make something that anyone at all could make. On the short list for immediate cooking were crackers with cheddar and black pepper because I love making crackers; risotto, because I'm a huge fan of rice no matter how it's made, caramelized brussels sprouts with pancetta because it sounded so danged good; and a pretty crazy recipe for cornbread. But then I saw the recipe for Creamy Carolina Grits. I adore grits. I made one ingredient change to the recipe - it called for fresh herbs, but I try not to buy fresh herbs in the winter unless I know that I'm absolutely going to use them. Buying one of those little packages, particularly when I need just a little bit, irks me. But that's fine. I have huge supply of dried herbs and I know how to use them. Ha! And ... because there are only two of us, and one of us isn't the biggest fan of grits or polenta. I cut the recipe in half. I mean, I could eat this stuff until I burst, but I figured it made more sense to be just a little conservative. The original amounts are listed below, though. It's also got an elastic band that can be used as a bookmark, to keep the book closed if you're carrying it around, and to keep it on the right page when it's open. These grits were super-creamy and rich (no doubt because of the heavy cream) and quite flavorful from the herbs and garlic. They're also not quite as yellow as typical grits made from yellow corn, again because of the addition of that cream. I'd say that these are special occasion grits, and definitely for dinner instead of breakfast because of the herbs and garlic. Well, I guess if you like garlic for breakfast, go ahead. For me, it's more of a dinner thing. Put the cream, milk, garlic, thyme, and bay leaves in a heavy bottomed saucepan and heat on medium-low heat until it simmers. Cook for 10 minutes, then remove the herbs and garlic. Since I had used dry herbs, the easiest thing to do was strain it through a fine strainer, then return it to the pan. A few tiny thyme leaves made it through the strainer, but that was okay. Crank the heat to medium and wait until it comes to a boil, then sprinkle the cornmeal in while whisking to keep the cornmeal from clumping. Once the grits have been added, keep stirring with the whisk or some other implement, making sure to scrape the bottom of the pan to make sure the cornmeal starch doesn't stick and burn. Since I used a pan with a nonstick interior, there wasn't really a lot of sticking. Continue cooking until the grits are smooth, but they still have some texture. The longer you cook, the smoother they'll get, but they'll also get thicker, so if they get too thick, add more milk or some water to thin them out. Because I live at high altitude and it's ridiculously dry now that the heat is on in the house, liquid evaporates very quickly. I ended up adding a full cup of water to these grits before they were done cooking. Needless to say, that's going to vary a lot, so just go by what you see and remember that when they cool, they'll be thicker. So when they're bubbling hot on the stove, that's thinner than they'll be on the plate. When they're done to your liking, add the butter and parmesan, then taste and add salt and pepper to taste. You can add a little of the salt sooner, but since the cheese is a little salty, use a light hand and adjust at the end.